I don’t know if you remember or not, but three Christmases ago I told my husband I’d make him a quilt. For Christmas I gave him the design and the fabric for Christmas! He was super excited! Ok, maybe not. He was excited to get a quilt, but not about unwrapping a pile of fabric! But I finally finished it! It’s just so big that it was hard to maneuver. I realized I’m not so great at really big quilts!! I believe it’s about 96″ square. 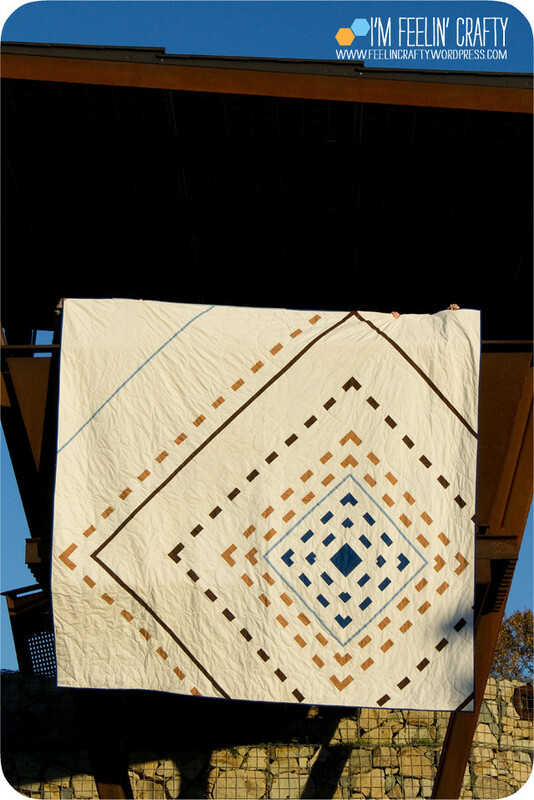 I’ve since started to use QAYG on the larger quilts. But the trickiest part was squaring it up! 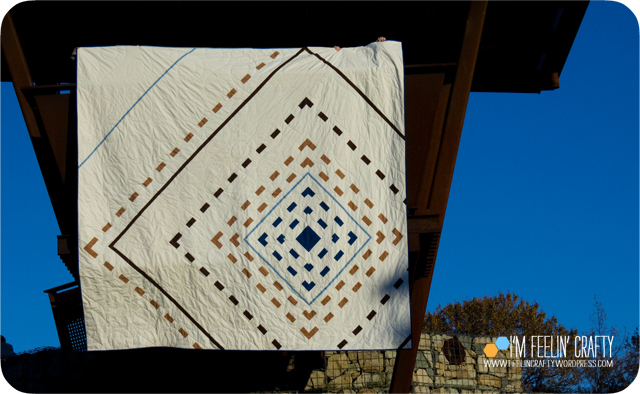 How do you square up a quilt that is too large to lay out in any room of your home? Not very easily I learned! Any tips would be appreciated! 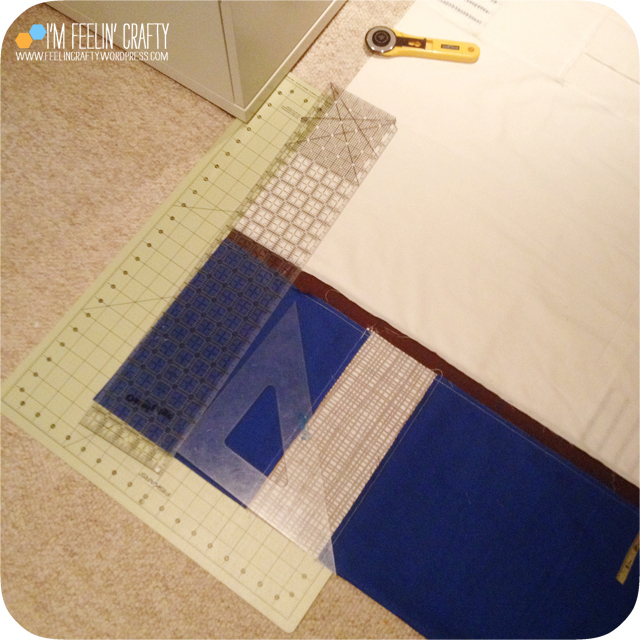 I had to square it up before I took it to The West Seattle Fabric Co for them to actually quilt! And the back! I actually love the back! I don’t know if I love it more than the front, but I might! 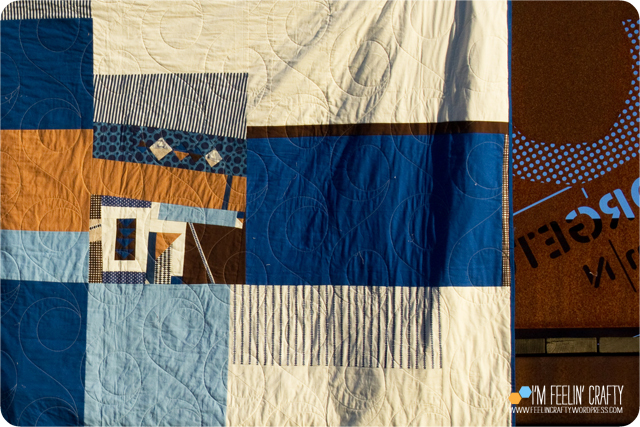 I submitted it to Quiltcon, but it was rejected… I wonder if I had submitted the back if it would have gotten a better response? hmmmm…. The center of the back was from a Round Robin I participated in at a Seattle Modern Quilt Guild retreat. I started it and then three other added on to it, all while a timer is ticking away. 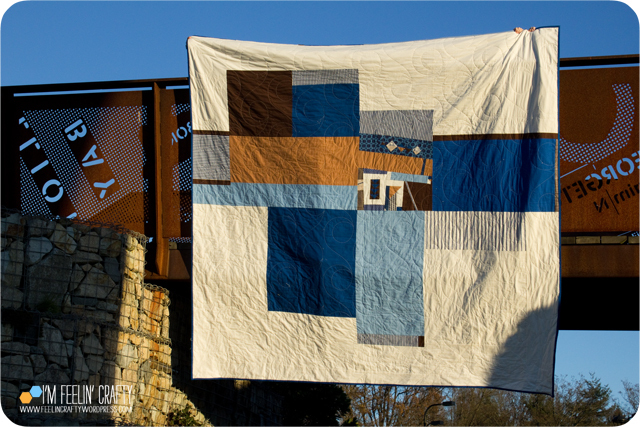 Like I mentioned, the quilting was done by The West Seattle Fabric Company and it looks great. I was just so ready to turn it over to someone to finish this one! Too big and heavy for me and my machine. I now understand why people hire people to quilt quilts! And I can finally cross this off my Finish A Long list! « Reindeer Food- a Printable for You! Gorgeous. What an awesome gift. Love the front and the back. Definitely would have a hard time choosing a favorite side. Great job!!! Thank you!!!! I do have trouble deciding which side I like best! Great quilt. Isn;t nice to get a project, long over due – DONE! My gifts often span a year or two. Initially gifted with the best of intentions – often planned on it being THE NEXT project, then life or an emergency arises and that gift is shelved along with possible ? last year’s too Me bad. Thanks! 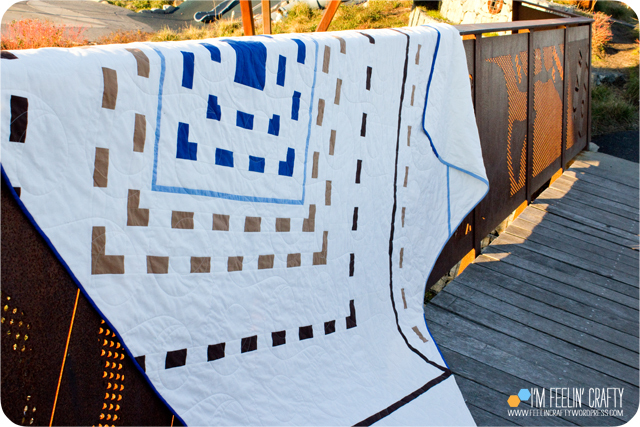 Yes, it does always feel good to get a quilt or project off the shelf and finished! Interesting story, especially since I did the same thing. I plan to blog about the quilt I made for my daughter this year. The blog is written, just not posted yet. 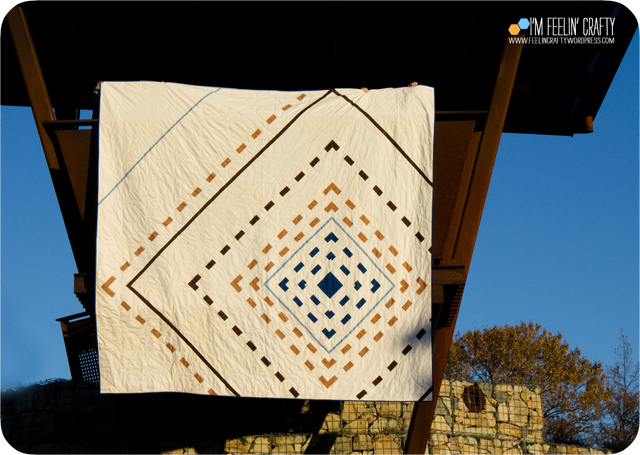 This is a great quilt in masculine colors and I like the modern design…on both aides. Congratulations! Thanks! Congrats for finishing your daughters quilt!! Thanks! And I love the little improv piece from retreat! Improv…auto corrected and I missed it. How do you print the instructions for the Sun Catcher ? I love the design they were to as gifts to some of the teachers at my school. I would like to make them as well for the other teachers that didn’t received them. You can cut and paste the blog post. Or just write it down. I don’t have a download for the instructions or anything like that. Good luck and enjoy!